This page describes the Postal Operations in Arkansas during the Territorial period with links to selected covers that ilustrate the story. Use the menu 19th Century-Arkansas Territory Covers-Little Rock Shield to view all reported postal usages of the Little Rock Shield Townmark. Use the Menu-19th Century-Arkansas Territory Covers-Little Rock Territorial Covers-non-Shield to see covers from Little Rock outside the Shield usage period. 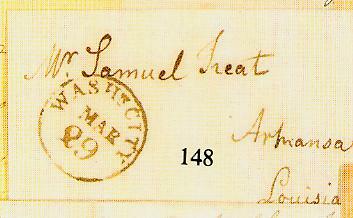 Three covers have been recorded mailed to or from what is now Arkansas before the Arkansas Territory was established in 1819. Click the links below to see these covers. 1) 1806-Letter written at "Arkansa" and hand carried (there was no postal service). 2) 1807-03-12 Letter from "White River" in Western Arkansas to "The United States Indian Factor, Arkansas" Privately carried to Arkansas Post and docketed as received March 24th. to "Arkansas" (Arkansas Post) Louisiana Territory. The following information is extracted from the article "The Post Office in Early Arkansas" by Nathan B Williams,in The Arkansas Historical Association, Vol 3, 1911, pp 310-324. Williams derived all the information from original PO sources. Canadian Crittenden George C Barfiield, 11/29/1832 "Discontinued 4/18/1831; Restored 2/2/1833"
Claddo Clark Jacob Barkman, 11/25/1828 "Discontinued 4/18/1831"
Cosetot Sevier Asa Hartfield, 9/13/1828 "Discontinued 1/8/1834"
Crystal Spring Lawrence Wm Russell 11/13/1826; Reuben R Russell, 2/7/1828 "Discontinued 8/28/1829"
Franklin Settlement Clark Thomas Franklin, 1/19/1827 "Disconitnued 7/13/1829"
Harrisburg Conway James Wand, 4/12/1830 "Discontinued 5/22/1832"
Long Prairie Hempstead Thomas Dillard, 9/30/1824 "Discontinued 8/5/1831"
Lost Prairie Hempstead Jacob Buzzard, 7/29/1828 "Discontinued 9/30/1833"
Masard Creek Crawford Edmund B Bayse, 12/22/1830 "Discontinued 11/28/1832"
Mount Prairie Pulaski Edward Johnson, Jr., 1/12/1829 "Discontinued 7/27/1830"
Nicksville Lovely John Dillard, 4/25/1828 "Discontinued 10/2/1829"
Oil Trough Independence Charles Kelly, 2/18/1829 "Discontinued 4/30/1829"
White Run Independence Peyton Tucker, 4/26/1832 "Discontinued 7/30/1833"
The following covers have appeared in auctions and publications. I have photos of each. All town marks and rates are in manuscript and black unless otherwise noted. Where available the cover scans have been uploaded and can be seen with a click on their link. Covers from Little Rock appear on two adjacent pages, one just for the Little Rock Shield marking, and another for all Little Rock Territory non-Shield covers. In February 2014 I traveled to the Arkansas History Commission in Little Rock and spent 4 days copying cover images in their files. I got nearly 400 images. There are many additions to the territory and all other areas on the website.